A bit of rehash of a favourite old outfit with some recent wardrobe additions. One of my favourite long sleeved tops and trusty body con skirts, paired with a River Island black blazer. I often get asked if I wear the same thing more than once, and obviously I do! I aint Rumi Neely! (Quote via Simone!) I don't often repost outfits, even when I wear them twice, because its not that fun seeing the same thing again! I have a pretty good wardrobe rotation scheme and tend to get alot of wear out of all my clothes, despite having alot to choose from! But this top is absolutely one of my favorites and I wear it once a week at least! Had a epic stress at university today, Sometimes its so disorganized it drives me mad. I some of my work out only to find out that I probably will need to print it all out again smaller because I presumed I'd have more space than I will probably end up having. We haven't been told anything about how to mount our work, what work we should put up or even how much space we have. It needs to be up by Wednesday evening but literally no one came in to college today to discuss it. ARGH! Oh well! Im packed and ready to go on holiday! Cant come soon enough! Can't go wrong with stripes! Gorgeous outfit! Don't let uni get you down you'll be out of there soon enough! Try sending a joint email to your tutors =]. I had the spotty version of this top and it shrank in the wash! I was so annoyed because it truely was the ultimate throw on and go top! Love how you've re-styled it and it's nice to know you wear things more than once - that's how it should be! We're not all made of money unfortunately haha! and I've got a question: Is there a forever21 in London? You must be stressed, dang, girl! When are you finished with school? Anyway, I love to see black and white outfits! So clean and simple, yet still really cute. I hope you have time to breathe and relax soon! Hope it get sorted soon Lily! Lovely top - can see why its one of your favourites! One of those tops thats easy and can be worn with anything. uh, i hated that about uni so much. i couldnt deal with stuff like that at all. come see my new blog for help and opinions! Obviously you rewear outfits more than once! Especially when they look that good! I love the top. I'm so fickle with clothes, and my favourites change from month to month. I keep things, but forget to re-wear them... They just sit there looking sad! love love love the accessories in this outfit! 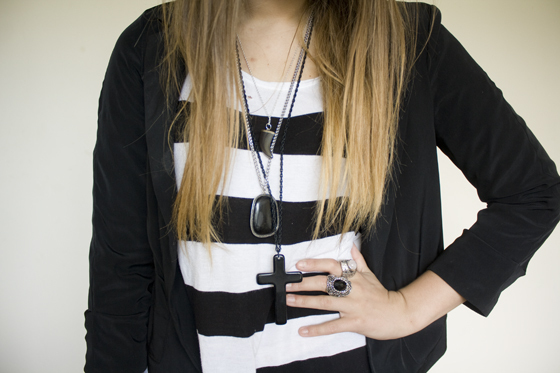 Loving your rings, and the cross necklace! I absolutley love this outfit! love stripes!and your rings're so amazing! Love the top, guess everyone has that one piece of clothing that we always wear no matter what. Unreliable people are a pain, hope everything works out in time for you showing, though! HAHAHAHAHAH I AIN'T RUMI NEELY!!! Awesome!!! I saw this top in H+M and knew I should have bought it! I need tops like this as I feel best in them, darn. fingers crossed it's still there, eh? i am absolutely in love with the way you mix those easy pieces... sometimes i get so... do u know when u have absolutely no idea about how to mix your stuf?! this is how i feel! how much would cost a personal styling session with you? i mean it. let's see what we can do! tell me ur price lady! I'm sorry for your university troubles! I know exactly how you feel, because I'm supposed to have signed up for classes already but everytime I go to the website, it says its down and to come back later. Its giving me so much stress! So I truly hope you get things all figured out! :) and I also have to say its great to hear that you re-wear cloting, like any normal person! haha, the summer version of your favie outfit! i like seeing pieces repeated to see how you work them into your wardrobe. i have a strict buying budget so i know i can't afford to get new outfits every week! ha. but very lovely outfit! great photos! I love that you always wear simple outfits, but make them special by wearing heavy jewellry. Hope you get things in university sorted out. Very nice! I love the white ring! I love that you re-hash your outfits, there's nothing like go-to pieces being paired in another cute outfit! maybe it's because, people check your blog too see if you have post something new and if not, they click yr blog away. that ppl read the text before the check up.. I love your stripey top, it's mega cute! I REALLY wish there was an H&M here where I live in Aus :( I see so many bloggers with fantastic stuff from there! Amazing style! I like the outfit very much and especially the jewellery. How are you doing you hair girl? I get annoyed at my uni too a lot 'cause they always give lecturers classrooms that are too small to hold the entire class. And everything needs to be rearranged. I love those H&M oversized tshirts, I've got a spotty one, a stripey one and a plain one! This outfit looks fab, I love all the necklaces! I have a similar top, and it's one of my go-to's as well! I hope your Uni stuff sorts itself out :) At least it's over soon!